All of these problems are important and require early resolution. The two first named must command the attention of all sensible men and governments for they present the greatest threat to man’s well-being. Wars, large and small, should by now be unthinkable, but, sadly, this is not the case. Even a world which has known the folly and futility of war at its most terrible has still not relinquished, totally, that abomination. The governments are seduced into thinking that old ways will, after all, render up their coveted prize. The weapons of war, therefore, have become indispensable and a major trading asset. While the weapons are there they will be used. Small wars beget large wars as more countries become involved. Large nations fight by proxy through their allies and so prolong unimportant quarrels into war. This major danger must be abandoned by all nations. It threatens the very existence of men on Earth. Apart from war, nothing so profoundly affects the future of all men as much as pollution. Some countries have recognised this fact and have taken some steps to limit pollution and global warming. Others, sometimes the chief polluters, deny the reality of global warming despite the overwhelming evidence to the contrary. Daily, now, the climatic changes prove beyond doubt that the planet is sick and needs immediate and skilful care to re-establish equilibrium. Time is running out for men to halt the transformation which is being daily wrought on planet Earth. Every man, woman and child must play their part in the task. Time is, verily, running out. S.O.P. Save Our Planet! Readers may be interested to note that it is hoped that S.O.P. will eventually become an internationally well-known phrase to rally all to take action to save our planet. Q. (1) How many interviews has Maitreya given to date? (2) Is He still giving interviews in Brazil? A. (1) 74. (As of 8 September 2012.) (2) Yes. Q. Could you explain something please: why is it that despite the terrible suffering in many countries, and despite the insane monetary and fiscal policies of many governments around the world, we the people are not out on the streets in our hundreds of millions demanding justice? A. Because we, the people, are not sufficiently organised and inspired. But wait, this is beginning to begin. Q. Do you think momentous events will take place this year? In the sense of irrevocable turning points in humanity’s collective experience – such as a fundamental shift in our attitude, for example, to how we treat our planet; or that enough people might realise the terrible cost of commercialisation? A. There are only a few months left of the year and the above will certainly not be achieved in that time. Masters do not tell fortunes and there is no magic formula. It is a case of gradual realisation and the will to change. Q. Is there still such a large surplus of food in the world? Mr Creme, you often talk about the food that lies rotting in the world’s storehouses; but just lately there have been such poor harvests in many countries. Perhaps there is less food stored than previously thought? A. Yes probably, but two thirds only of the food produced is actually used – the rest is wasted. Q. NASA has film taken by Curiosity on Mars which show quite a number of objects, which look a lot like spacecraft. (1) Did Curiosity, the Mars Rover vehicle, really film some UFOs? (2) Do you happen to know whether NASA has acknowledged this – either privately or publicly? A. (1) Yes. (2) I do not know. Q. The recent Rover that NASA landed on Mars, called Curiosity, is nuclear powered. Are the people on Mars now keeping an eye on the Rover and cleaning up its nuclear pollution? Q. The Americans have just landed Curiosity on Mars, with many cameras. It seems that it would be a wonderful, playful and non-threatening greeting and introduction for a few people on that planet to go over and give us a wave or make a pile of rocks. It would be simple and neighbourly, and much less ambiguous than the spaceship appearances and crop circles. Might someone connected with Share International have the ability to suggest this to the folks on Mars? A. The Space Brothers do not work in this way – they work in such a way as to not infringe our free will. They are not desperately anxious to be recognised. Q. Apparently people are worried about a gigantic cloud coming our way: a new study of an unusual, elongated hydrogen cloud, known as Smith’s Cloud, shows it’s on a collision course with the Milky Way. What effect, and when, will this cloud have on our planet? A. Is it not strange that people always worry about the bad effect of a happening in Space, on their own local neighbourhood? This cloud ‘drifting’ will have a highly invigorating effect on the suns and planets of our galaxy. The exact effect in Idaho or Florida is beyond my knowledge. Q. Many members of Transmission Meditation groups see themselves as “volunteers working for a particular foundation or organisation” – for instance, Share International Foundation or Share Nederland Foundation. This is, of course, a fact. However, there’s also, I gather from your books, a deeper and broader reality, which relates to the fact that you work under the inspiration and guidance of a Master of Wisdom. Could you comment please on the underlying purpose of the groups that work with you? 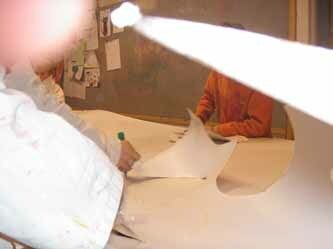 Does emphasising the outer structure influence the inner work? A. I hope that this question comes from a new volunteer in one of the worldwide groups working for the Reappearance. Otherwise, I would think that over the years I have been talking and writing to the clouds of the air, while the audience was blissfully fast asleep. The Hierarchy of Masters never do things by halves and They make a little work go a long way. They take every opportunity to enlarge the effect of the energy generated by the activities of the groups through whom They work. This process began literally in 1975 when five Masters, the forerunners of that group, entered five major spiritual centres in the world: New York, London, Geneva, Darjeeling, and Tokyo, followed soon after by another Master in Moscow and the seventh in Rome. At the same time this group of co-workers has been set another inner work. For several centuries the Masters have tried many times through different groups to achieve Their avowed aim of Group Initiation. Many Masters have worked towards this difficult task without success. Never has there been a strong enough uniting bond between the groups to make this possible. Always has been lacking an idea, a Call, magnetic enough to inspire the many groups involved on a world scale. Now the idea of the Return of the Christ has provided the co-workers with an idea magnetic enough to hold the groups together, working in all parts of the world. Today for the first time a little start has been made. The task is difficult; readers should acquaint themselves with the requirements of Rule 11 (*) given by the Master Djwhal Khul through Alice A. Bailey in order to understand this difficult process. Too great an emphasis on organisation (the outer structure of any group) has a negative effect on the quality of the inner work of the group. Q. There are reports on the internet warning of a severe cyber-attack on banks and financial institutions – starting in America. This would inevitably lead to a collapse of the global economic system. The attack is due to take place soon – in October or November 2012. Can you and your Master please say what you know about this cyber attack? A. Since this seems to come from so many quarters it is obviously known to the institutions that would be targeted in this way. I am sure that they would take every possible precaution to avert such an attack. That is not to say that such an attack has not been planned but whether it would succeed is another question. Q. What is your opinion of the internet? A. It is a very useful means of communicating, but not necessarily better than the spoken word from one person to another. Q. (1) Was the Industrial Revolution part of the Plan? It gave rise to the union movement and recognition of workers’ rights; machines also began gradually to remove some of the drudgery of heavy physical labour. (2) Do the Masters consider that more good came from it than bad? Q. I read in one of your books that the family is important in society. Surely ‘the family unit’, marriage or partnership and children, is a purely ‘man-made’ phenomenon? Why is the family important? A. The family is the basis of society and the human kingdom. We incarnate again and again in family groups. This provides the arena for the working out of karma and so ensures cohesion of the human kingdom in its long journey of evolution. Q. If a person remains calm, are the Masters able to give more help, when asked for help and within the Law of Karma, than They would otherwise be able to give? If so, why is that true? A. Yes. It is true because the person who is calm is more open to being helped than he/she would be when their nervous system was more agitated. Q. I have an unobstructed evening view of 85 per cent of the sky. The other evening in August 2012 I took a picture with my cellphone of an object in the sky. I have the latitude and longitude from the position where I was sitting. It was not the full moon, as the moon rises directly from the eastern horizon. This was low and just over Barnegat Bay, New Jersey. It was not the lights of an airplane or helicopter. I have photographed the sky since, and there is nothing there on all subsequent nights. I have lived here for over six years. This has never been here before. I am thinking that you need to correlate the positioning of these sightings to the location of nuclear power plants. This one was just in front/overhead of the Oyster Creek Generating facility’s property. A. This was a UFO from Mars. It was examining the quality of air above the nuclear power plant. We present a selection of quotations on the theme of ‘Unity in diversity’ from Maitreya (Messages from Maitreya the Christ), Benjamin Creme’s Master (A Master Speaks), and Benjamin Creme’s writings. Humanity will come into the total understanding that we are one group called humanity, that there is nothing separate in the whole of cosmos, that everything relates to everything else, that the laws that connect humanity are the laws built out of the non-existence of cleavage of any kind throughout cosmos. We will grow with the impact of the energies of synthesis, streaming to us from Aquarius, into this sense of being fused and blended together. That is the essence of the energies of Aquarius. They only work through the group. The energies do not work through individuals. Individuality will not disappear, but will be placed at the service of the group…. In country after country, the voice of the people is becoming more focused and distinct. Millions are now educated and sure of their needs: peace, work and hope for their future. 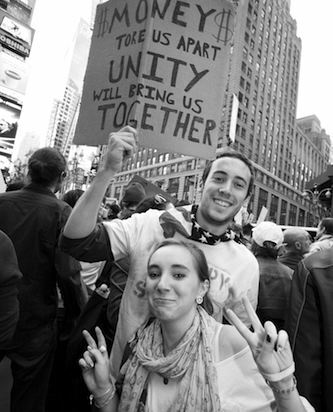 A growing sense of unity, too, is beginning to inform their expectations and demands. They know they are not alone in the world but have millions of brothers and sisters everywhere, with the same problems and needs. Man has for so long denied the existence of a Divine Plan that he has little to go on to realise that such an essential aspect of the Divine Plan as unity does not just happen by itself. It has to be cultivated and nourished. It has to be taken care of “as a wise gardener cultivates his garden, tending carefully each new bud and shoot”. It is not something which just grows in such a way that if you do this it will happen, and if you do not, tant pis, something else will happen; it is no loss. Unity has to be seen as a continuous gain, something into which you put time, energy and nourishing love, and out of that comes the beauty of the unity which can only be achieved in that way. However, in the time immediately ahead, men, more and more responding to the beneficent energies of Aquarius, will realise the divisive nature of competition and will gladly acquire the habit of co-operation. In this way the world will reap an enormous benefit, as men work together as equals in the many tasks of reconstruction which will await their service. Thus will the world be transformed by willing hands. Thus will the new world be wrought. In this coming time we shall have to make a shift in consciousness to include every aspect of our being in our definition of ‘spiritual’. All our structures must be based on the inner Oneness of humanity and reflect that reality. As souls we are One. We have to create political, economic and social systems which allow that inner divinity to express itself. Synthesis has to do with relationships – for instance, the relationship of ideas. Through philosophical investigation you can broaden the consciousness until what seemed the most distant can be seen as standing side by side. Not only complementing and completing each other, but throwing light on each other. It is this ability to synthesise that inevitably broadens the consciousness of humanity and makes correct human relationships possible. When man sees the universe and himself as One, all things become possible. We have to see ourselves as One and at one with the universe: that there is no difference between us and the universe; that we are intrinsically related to every other being on Earth and everything on Earth; that the atomic structure which makes us up, makes up everything we can see in the whole of cosmos; that there is only unity. I am emerging soon, but first I would point the way into the new direction which man, if he would survive, must take. Firstly, men must see themselves as brothers, sons of the One Father. This is essential if they would progress one step nearer the Godhead. Throughout the world there are men, women and little children who have not even the essentials to stay alive; they crowd the cities of many of the poorest countries in the world. This crime fills Me with shame. My brothers, how can you watch these people die before your eyes and call yourselves men? My plan is to save these, My little ones, from certain starvation and needless death. Notwithstanding the pain and suffering so widespread today, many are sensing a new confidence in themselves and in the future, a new hope that the present ills are transitory, and that a better time is near. Thus we stand today on the verge of an era of new knowledge, broader concepts, wider horizons and richer experience than aught known before. At precisely such a time has entered the new Teacher. His will be the task to enlarge even further these horizons for man, to show that all is interconnected, that we live within a family, as brothers, and that each contributes to the well-being of the whole. Thus man will come to sense himself as an integral unit in a vast system which stretches to the stars; as a tiny point of conscious, loving life, without which the Universe would be poorer. Thus man will come to see his greatness, and his function in an endless scheme of interrelated points of light and energy and knowledge. I started in 1976 with Benjamin Creme’s first lecture in the Netherlands. I immediately knew that this is the WAY, THE WAY of SHARING. This is the Future. At last Peace on Earth. I am very interested to know who these sweet people were, were they special people? And if so, who were They? C.N., Egmond aan Zee, the Netherlands. Around a year ago I came across the information Share International has been spreading for decades. It was through a radio programme on Mantra FM, an Argentine internet radio station. I was very impressed by the information and last March we formed a small Transmission Meditation group in our town. Lately we thought about acting more and decided to distribute the newspaper Emerger Mundial (the Spanish Emergence Quarterly newspaper), so we started distributing them around a month ago. On 25 July 2012, at a local festival in La Coruña, after a long walk distributing copies of the newspaper, I met a quite unusual man. He was asking for food, but he had a very elegant bearing, and his clothes, although old, were also very elegant! He explained to me that because it was a holiday, he couldn’t go to a soup kitchen to get a meal and asked very politely if I could give him some money to buy food. I had already met this man, close to my house in January, a few days after my mother passed away and I was not well at all. Then he also impressed me a lot, although I can’t remember now if on that occasion I gave him money, but he aroused in me the same feeling as this encounter. I felt he was someone special, with grey and long hair and a beard, and very special eyes, blue as the sky. They got recorded in my mind. I wonder if he was someone special or perhaps a Master. I have met him on two ‘special’ moments of my life and on both occasions he transmitted to me much peace. Thank you for all that we are receiving from Share International. On 30 November 2011, I was giving a lecture in Vienna about the emergence of Maitreya. At about 6pm, during the preparation of the room for the lecture, someone was knocking at one of the windows where I was testing the video-projector. It was already dark outside, so I could not see who was knocking. I went close to the window and noticed a very dark-skinned African man wearing an anorak with a hood. By rubbing his fingers he showed me that he wanted money. I remembered that I had left €1 in a pocket of my anorak. I picked out the coin, went to the entrance door and gave the coin to this man. He took it and in broken German tried to make me understand that in order to get his teeth fixed he needed more than this, at least €10. He looked at me very convincingly, so I went back to the other end of the room to get a €10 note from my wallet. While I was again walking towards the entrance door I was wondering about myself why I was acting so differently than usual. As soon as I had handed out the note the man pleaded for an additional €10, explaining that he would then have all the money together needed to definitely get his teeth fixed. I must admit that I am not a very generous person. Nevertheless, I had no problems to give him one more €10 note. He thanked me very emotionally, shook my hand and went off. May I kindly ask if the beggar was an ordinary man or a Master in disguise? When I became aware of The Ageless Wisdom Teaching, some part of me recognised that I had finally felt my best reason for being and I truly became a lot happier because of it. Since then, I never tire of seeking and digesting its incredibly important messages wherever I find them and wish to simply express, in the strongest heartfelt way possible, how grateful I am to the Masters and all their helpers for working to uplift us all, as they are doing. It has opened a channel of Love in me that I experience as boundless. Thank you for all you do and for my part in it. P.M., Nanuet, New York, USA. (1) The annual North American Transmission Meditation Conference took place in mid-August 2012 outside San Francisco with over 100 people in attendance. At the end of Transmission Meditation the first night, a friend and I were walking back to the dormitory just after midnight when we noticed activity fairly low over the dormitories. A UFO was flying over the ridge in front of us at the far end of the camp. The outline of the craft was not visible in the dark, but it had what seemed to be two red ‘headlights’ that did not blink, and a larger and very bright white light, where the cockpit would be, that did change. 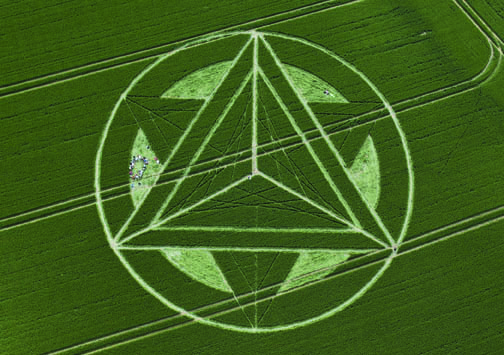 In fact, it responded to our telepathic requests to change shape and we sensed an intuitive connection to the comments and observations we were making. This first craft noiselessly crossed the sky from right to left and then banked over the dormitories. It was followed by another, and then another identical one. All told, there must have been 24 or 25 passes in the 45 minutes we watched, though it may have been the same three or four ships circling back and doing another fly-by. Later, as I was sitting outside writing up the experience by flashlight, two of the same craft flew by at a three-minute interval, extremely low in the sky and directly in front of me. 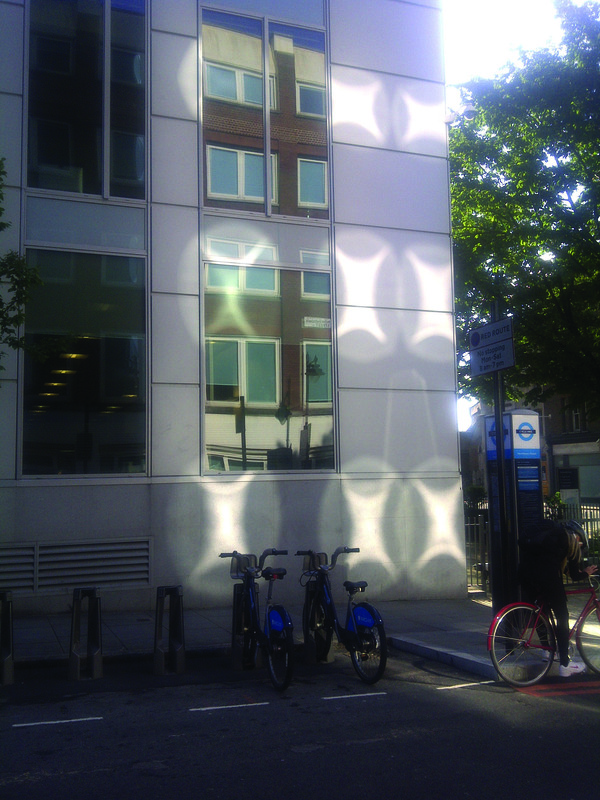 This time, I could see portholes at the front that pulsed with light. Could you tell me where these craft were from, who was manning them and what they were doing there? Unfortunately, the sky was overcast and they were not visible on the next and final night of the conference. (2) This sighting reminded me of events that occurred at the same conference in August 2010, when Benjamin Creme was present. During the question-and-answer session on the second afternoon, Mr Creme was asked if Maitreya’s ‘star’ might appear that night as a special dispensation to the group. He said he could not guarantee anything, but as we left Transmission Meditation around midnight, there it was, shining very low over the conference grounds and HUGE, pulsating with shimmering internal light. The same friend and I, plus a few others, decided to go down to the edge of a nearby lagoon to get a better look as there were no path lights there and it would be much darker. It was at this point that another fly-by of space ships occurred. There must have been at least 30 of them that came by en masse, flying low just over the water, the full length of the lagoon and then out to sea. They were flying so low in fact that we could even make out portholes. Could you please tell me where these craft were from? 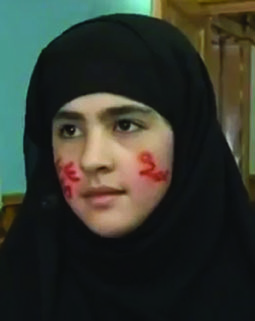 During Ramadan this year (2012), a 12-year-old girl called Wagma, in Kabul, Afghanistan, experienced an extraordinary miracle. She explained that after waking up and reciting the Koran: “An old man with a long white beard came to me who was full of noor (blessings) and wearing white golds and shawl. I was praying. He came near me, moved his shawl over me and gave me a smile and disappeared. Photograph sent by D.P. taken in February 2011 at a children’s visual arts workshop in Moret sur Loing, France, shows a light blessing from the Master Jesus. 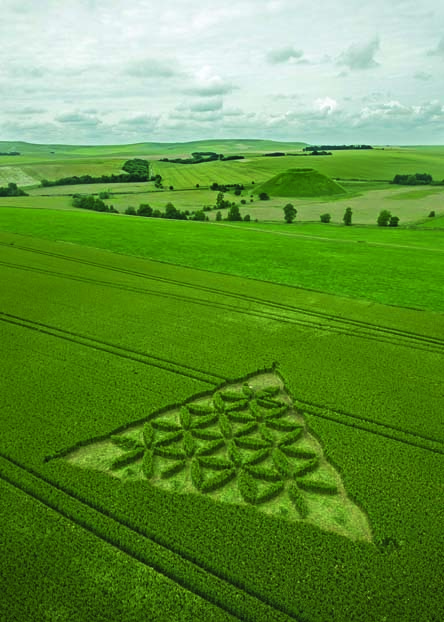 Two of the recent crop formations created in cereal fields in the UK. Benjamin Creme’s Master confirms that the Waden Hill formation was created by a spaceship from Venus, and the Liddington formation was made by a spaceship from Mars. Please, Click the Waden Hill image to see the image in full splendour! Very emphatically He told me that we are about to witness an exceptional moment in the history of mankind, it will be very soon, and that His power and glory will manifest in ways we had never seen or even imagined. That time is drawing close. A former CIA agent says he has seen evidence that a UFO crashed in Roswell, New Mexico, in 1947, and that bodies of extraterrestrials were recovered with the craft. Chase Brandon, who worked for the CIA for 35 years, visited a special section of CIA headquarters in the mid-1990s called the Historical Intelligence Collection. Although Brandon will not reveal exactly what was in the box, he said it contained “Some written material and some photographs, and that’s all I will ever say to anybody about the contents of that box. But it absolutely, for me, was the single validating moment that everything I had believed, and knew that so many other people believed had happened, truly was what occurred. We are about to witness profound changes in all our institutions and structures – political and economic, religious and social, scientific, educational and cultural. These changes will take place as humanity grasps, stage by stage, its essential Oneness, and adopts the measures necessary to implement that Oneness.One of the major things which will happen after the Day of Declaration is the turning of the attention of humanity really strongly to the cleaning up of the environment and making this Earth viable again. Every human being, of whatever age, will be involved in this process. As soon as the needs of the starving millions are met, as soon as the process of sharing is under way, then the attention of all must turn to the support of our eco-systems, otherwise there will be no planet. The first human priority is the saving of the millions now starving to death in the Developing World. A crash programme of aid on a world scale will be needed to alleviate their plight. No effort should be spared to ease the distress now being suffered in some of the poorest areas. There is nothing more urgent or important to do in the world today. All else must follow this primary human necessity. One of the major things which will happen after the Day of Declaration is the turning of the attention of humanity really strongly to the cleaning up of the environment and making this Earth viable again. Every human being, of whatever age, will be involved in this process. As soon as the needs of the starving millions are met, as soon as the process of sharing is under way, then the attention of all must turn to the support of our eco-systems, otherwise this planet would no longer be habitable. Maitreya Himself has said that the saving of the environment must become the first priority of all people, young and old. The effects of global warming on the ice caps, for example, are now evident to all. A huge programme of reforestation awaits our attention; this, of course, will take time to achieve, but a start could be made now. You will find that the basis of Maitreya’s teaching is right relationship: between man and man (and woman); man and God; and between man and his environment, the planet. We will come to understand that man, nature and God are One, and that proper care of the planet (and all the kingdoms in it) is essential to the well-being of the whole. The Christ, Maitreya, will call for the acceptance of the principle of sharing through the redistribution of the world’s resources – the food, raw materials, energy and technological expertise, largely usurped (and wasted) today by the developed nations. When we have accepted the principle of sharing (which principle will be forced on the governments by world public opinion), each country will be asked to make over, in trust for the world, that which it has in excess of its needs. Every country will be invited to make an inventory of its assets and needs. Fed into computers, these statistics will provide a United Nations Agency, set up for the purpose, with the information on which a rational redistribution of the world’s resources can take place. In this way a better balance between the developed and underdeveloped world can be achieved. It has been estimated that the redistribution programme will take two to three years to implement. The plans and blueprints for the scheme, drawn up by high initiates – economists, financiers and industrialists of great achievement – have long been in existence, awaiting only the demand of humanity for their implementation. A sophisticated form of barter will replace the present economic systems. There is no doubt that there will be opposition from those more privileged members of society who will see in the changes which must take place a loss of their traditional status and power; but the need for change will become so overwhelmingly obvious that they will find themselves increasingly powerless to halt the momentum. For several years, in five major centres (New York, London, Geneva, Darjeeling and Tokyo) groups have been trained by a Master in the precise legislation which will change our present chaotic political, economic and social structures along more rational (and more spiritual) lines. With the minimum of cleavage, the minimum disruption of the existing social fabric, far-reaching changes can be expected over the coming years. The democratic system will still hold, and will be seen to be right and effective when it is, for the first time, truly directed to the common good. The participation of all sections of society in the construction of the new social order will ensure the speedy adoption of the measures necessary for its implementation. The United Nations Assembly will come into its own as the international legislative body. The work of the Assembly is inhibited today by the lack of support given it by the major powers, in particular the USA and Russia, and by the existence of the Security Council with its power of veto. The Security Council has outlived its usefulness and now must make way for the more broadly-based voice of the Assembly to be heard. The United Nations is the blueprint for a future World Government of federated independent states. It is not part of the Divine Plan that the nations should live under one political system. Democracy and Communism are each the expression, more or less distorted, of a divine idea. In their eventual perfect expression each will give to the world a model of social organisation suited to different peoples in different circumstances. “Unity in diversity” may be said to be the keynote of future political groupings. Profound changes are already taking place in the industrialised world with the advent of micro-technology. Machines, ever more sophisticated, will increasingly take over the means of production. Today’s problems of unemployment will become the problems of leisure. Education for the right and fullest use of leisure will be of paramount importance. Eventually, all the artefacts of our civilisation will be made by machines, thus freeing man for the exploration of his own true nature and purpose. In time, these machines will be made by an act of man’s creative will; we have, as yet, scarcely touched the surface of the potential of the human mind. The Advent of the Christ and the emergence of the Masters of Wisdom will bring an enormous sense of relief and reduction of tension to the world. The gain in physical and emotional well-being will be considerable. Much of the physical disease in the world today has a psychic cause: the strains, the tensions and fears inherent in our divided society and world. Given true hope for the future, the general health of humanity will improve. Quite apart from this, new approaches to discovering the causes of disease will be made. The existence of the etheric planes of matter, i.e. matter finer in substance than gas and normally invisible, has long been postulated, and accepted by esotericists as axiomatic. This is the next area of matter due for investigation by our exoteric scientists. Kirlian photography and the work of Wilhelm Reich have already pointed the way. It will be realised that the health of the physical body depends entirely on the etheric ‘double’ or ‘counterpart-body’. The force centres (or chakras as they are called in the East), which focus the etheric flow, have their counterparts on the dense physical plane in the major and minor glands of the endocrine system. We are just beginning to understand how important to our well-being is the correct, interrelated functioning of the endocrine system. This in turn is dependent on the proper functioning of the vital etheric body which substands it. The alternative, so-called ‘fringe’ or complementary medicines of today (they are really very old indeed) will take their place beside the more orthodox methods. Teams of doctors and healers of various disciplines will work together, each bringing their particular insights and gifts for the greater benefit of the patient. The Masters are, without exception, adept in the esoteric healing arts, exemplified so dramatically by the Christ in Palestine. Their inspiration and guidance will quicken the pace of experiment and discovery and lead to results undreamt of today. There is, parallel to the human, another great evolution, the Angelic (or Deva, as it is known in the Orient), which has much to give and to teach humanity in connection with disease and its cure. In the not too distant future, very real contacts will be made between the two evolutions which will result in a great expansion of man’s awareness of his true nature and of his place in the scheme of things. This whole subject is so deeply esoteric and abstruse that only the briefest mention of it can be made here. Certain diseases such as syphilis, tuberculosis and cancer are endemic in humanity and unbelievably old. It will take a long time to rid the world entirely of these scourges, but eventually it will be done. And in the meantime, enormous strides will be made in their control and in the amelioration of their effects, as is already the case with tuberculosis. The universal adoption of cremation as the only hygienic method of restoration to the earth of the body after death will speed this process. For countless ages, through burial, diseases of the physical body have been absorbed into the earth to be reabsorbed in vegetable and animal tissue. This has occurred for so long that the Earth itself is contaminated. The coming age will see certain profound changes in human perception which will give to humanity an altogether deeper and richer experience of the Reality in which we live: telepathy and etheric vision will become part of normal human equipment rather than being, as now, relatively rare. We are all telepathic (we share this faculty with the animal kingdom), but with most of us it occurs unconsciously, spasmodically, without any control or intention. Gradually, in this New Age now dawning, telepathy will become the normal mode of communication between people at the same stage of evolution. The Christ’s overshadowing of all humanity on the Day of Declaration foreshadows the future ability of humanity to communicate mentally, telepathically, at will, over any distance. Lying will automatically become impossible and speech will gradually die out. We know, today, three states of physical matter: solid, liquid and gaseous. Esotericism postulates the existence of four further states of matter above gas, the etheric planes. We live in an etheric ocean, our etheric bodies being more complex concentrations of that ocean. The Master Djwhal Khul has prophesied that a change in the physical eye will occur to confer the “double focus”, etheric, vision which allows the perception of these subtle planes. A whole new world will open for humanity; the beauties of the subtler planes will be revealed. Many of the world’s great cities are built on etheric power-points; the quality and tone of these energetic concentrations will become a major source of discovery and study. One of the most profound changes which will take place will be in our approach to death. Man will lose his fear of death. Humanity will come to accept and understand the Law of Rebirth; that the death of the body is but the transition to a new and freer state; that the soul in its long journey in incarnation takes vehicle after vehicle through which to reflect itself on the physical plane. Death will lose its terror. When the body is old and depleted in strength, death will be cheerfully sought as the doorway to renewal and further experience. The Christ, Maitreya, will affirm the slow, gradual evolution of man through the process of reincarnation (the Law of Rebirth), and through our understanding of this Law and its relation to the Law of Cause and Effect (the Law of Karma) will come the sure basis for the establishment of right human relations. We will come to understand that our thoughts and actions from moment to moment set in motion causes whose effects make our lives what they are, for good or ill. So we will see the need for harmlessness in relation to others, a harmlessness based on the ‘will to good’, expressing itself as goodwill. The Christ will proclaim the truth that the Kingdom of God exists on Earth, and has always existed, in the fact of the Spiritual Hierarchy of Masters and Initiates, and that one day, through His Agency, all His people will be members of that Kingdom. The Ancient Mysteries will be restored, and man will know himself as the divine Being that he is. All people, eventually, even those not engaged in the religious field, will share the sense of a spiritual basis to life. All will endeavour, in whatever field of human activity they may be engaged, whether political, scientific, educational or artistic, to give expression to this sensed inner truth and will build a culture and a civilization directly reflecting their experience that God, Nature and Man are One. Then revelation will follow revelation, until we will find ourselves in possession of that knowledge which will open for us the secrets of life itself and will allow us to become conscious creators and co-workers with God. This will be possible when humanity’s will and God’s will are one and the same. A creative interplay between God and man can then take place, and the true nature and purpose behind the human evolution will become apparent. This will lead to the creation of the Divine Science known only to the Masters of Wisdom. One day, through man himself, this science will become the instrument whereby the forces of the universe can be harnessed and utilized in the service of the Divine Plan to further the evolution of all kingdoms in nature. Under the guidance of the Hierarchy of Masters, man will find himself able to control forces and energies of which he is today totally unaware, and of which today he is totally at the mercy. He will be able to transcend time and distance by the power of his thought and to create modes of travel so silent and apparently motionless that fatigue will disappear. Through the power of sound he will build his artefacts and control his environment. Naturally, all of this depends on our ability to surrender our little separate wills and bring them into line with the Divine Will and Purpose. It is to this end that the Christ, Maitreya, and the Masters will work. Theirs is the task so to lead and guide that we willingly, gladly, make this surrender ourselves, in the light of our own soul’s vision of the scope and majesty of the Plan. A new era of peace and goodwill is dawning in the world. Nothing can now prevent the inauguration of this era of tranquility and equilibrium. The cosmic forces released into the world by the Christ are definitely making themselves manifest on the physical plane and will continue to do so in ever-mounting potency. These forces will lead to results which at the moment seem to be impossible of achievement. More and more, these energies will condition the ways of our thinking and feeling, and will lead eventually to that desired state of fusion and synthesis which will be the keynote of the Aquarian Age. Then we will recognize the fact for so long hidden and unmanifested: that Humanity is One, part of One Life. After the Occupy encampments in various US cities were broken up by the authorities and the cold weather hindered further protest in that form, people outside the movement began to wonder publicly whether or not it had perhaps lost its momentum, or worse, died. To answer that question, I researched Occupy and some of the sister movements in other countries and interviewed over a dozen people from various cities in the US and elsewhere who have been and continue to be involved with the movement. Everyone was asked the same questions, and their answers are summarized in the following paragraphs. 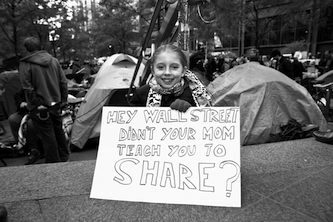 Although as one person opined, “This is just the first chapter of a much longer story,” there was general consensus regarding what Occupy has already accomplished. Most people noted that it has changed the public discourse by shifting the debate to inequality, pinpointing the root of our problems. Class and the capitalistic system per se, previously taboo topics, are now being addressed in the mainstream media. Occupy groups are now discussing how they see the movement developing from this point and what its focus should be, and the individuals I spoke with had varying opinions on the topic. Most agreed that the systemic critique is the most important part of Occupy, and will still inform the thrust of the movement, and they also agreed that the movement is in transition. Several felt that ways to make it sustainable over the long course must be found, so that people can participate and still continue with their everyday lives, and that new ways for people to easily take part must be developed as well. Bill Zimmerman states it this way: “New tactics must now be developed that encourage wider participation. In the coming struggle, militancy, civil disobedience and illegal takeovers will all be necessary, but more important will be new tactics that allow the less committed to ally with the more militant. This is not a daunting problem. New tactics often emerge from new movements (e.g., lunch counter sit-ins, Freedom Rides, draft card burnings of the 1960s, gay-pride parades, etc). Some named specific initiatives that they thought should be a future focus, such as The Commons, getting money out of politics, the global process of change, or developing content to speak to the 99%. The need for a discussion on how to unify nationally in a non-hierarchical way was also mentioned, as was the need to go back to basics to build the movement – going in person to neighborhoods and doing outreach…. The 15-M movement began as an outgrowth of a demonstration in Madrid on 15 May 2011. Afterwards, some of those attending decided to continue the protest by camping in the main square of Madrid. As did Occupy, the 15-M movement quickly turned from protest alone to constructing models of the society that it wanted to create. Now it has become a culture of small-scale groupings that work on and demonstrate solutions to common problems. There are co-operatives addressing work, housing, energy, education, finance, nutrition, etc and a web of collaboration connects the co-operatives. The goal is structured change of the worldwide political reality, and the movement operates under the principles of inclusiveness, horizontality, collective intelligence, respect, and non-violence. Protesters share a strong rejection of unemployment, welfare cuts, Spanish politicians and political system, political corruption, capitalism, banks and bankers, and support what they call basic rights: home, work, culture, health and education. James Quilligan has been an analyst and administrator in the field of international development since 1975. He was a policy advisor and press secretary for the Brandt Commission, an international development panel created by the former West German Chancellor Willy Brandt. Quilligan has since served as a policy advisor and writer for many politicians and leaders around the world, including Jimmy Carter, Pierre Trudeau, François Mitterrand and HRH Prince El Hassan bin Talal. He has also collaborated with several United Nations agencies as well as international development organizations on global commons issues and has served as an economic consultant for government agencies in 26 nations. 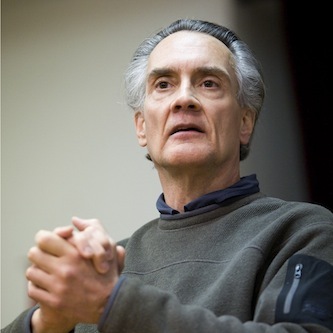 Quilligan is presently Managing Director of the Center for Global Negotiations and Chairman of Global Commons Trust. He is also a Board Member of London’s School of Commoning and of the US publication Kosmos Journal. Jason Francis interviewed James Quilligan for Share International. Please see previous SI for part one. Share International: What elements would a functional (sane) economic system include, internationally and nationally? James Quilligan: We have to recognize that true sharing won’t happen unless we provide a new context for it – and we can’t wait for governments to do this because they have already been captured by the corporatocracy and absorbed into the Market State. We are simply not creating the incentives for sharing through the private and government sectors. We lack the accountability structures and trust that hold us responsible and encourage us to share. Think about this: debtors are obliged by law to pay back their debts, but people with an economic surplus are not legally required to redistribute their wealth. We take this for granted but it’s an egregious double standard. I believe it’s the essence of the problem: there are no legal or policy mechanisms to promote the automatic redistribution of the world’s resources. Of course, sharing must be voluntary and from our hearts. Sharing is part of our growth and development as individuals, which involves personal freedom and choice. Yet, there must also be collective agreements and standards to create the norm of sharing, to motivate us to share, and give us the opportunity to build the infrastructure of sharing. I’m not talking about developing government regulation. This is about the creation of local agreements and norms among people which encourage them to share. Our ancestors developed customary understandings and informal rules for sharing their resources, so it shouldn’t seem like such a novel idea to us now. Citizens should have the opportunity to participate in rule-setting and decision-making at all levels of the commons, which is entirely lacking today. This means developing accountable relationships at local, state, interstate, regional and global levels. It also means re-establishing goodwill and trust in the world. We’ve got to bring governments and corporations back under public control and responsibility, which is what these huge social institutions were intended to do when they were originally created. Government and business are now simply too big to fail and have to be propped up and subsidized by the people and their commons. This is untenable. These giant institutions must come back under the trusteeship of the people. SI: How would a more equitable economic system be structured in relation to the global commons? JQ: In my view, creating a new framework for the global commons would require three broad adjustments. First, Commons trusts would have a responsibility to preserve natural, genetic and material commons. A trust would set a cap on a particular resource for future generations – to set it aside, preserve and protect it. The trust would then rent a certain percentage of this resource to businesses. Second, businesses that rent the rights to extract and produce these resources from the trust could then create profit and generate positive effects through innovation, production, sale and distribution of their products and services, just as they do now. The main difference is that businesses would not own the resource directly but rent it from the trust. Third, the government would use the taxes from businesses to create a dividend or basic income for the people and also to generate funds for the restoration or replenishment of the resources. I believe these essential changes will lead to a new world of sharing. Commons trusts would be created, the role of businesses would change from ownership to rental of the commons, and governments would divide their responsibilities equally between the licensing of the private sector and the approval of charters and open licenses for the commons trusts in order to preserve our resources for future generations. SI: Who is involved in a Commons trust and how are they overseen? JQ: There is no ‘one way’ to create a trust. It depends on the people, what they want, the degree of stakeholder involvement, the local culture in the area and the nature of the resource that they want to protect. People must have the right to self-determination. So participation in the process isn’t going to be uniform across the world. Given all of this, the principle behind the creation of commons trusts is fairly standard. As many stakeholders as possible should be engaged in the decision-making over how to share a particular resource. This would include the users, managers, producers and providers of different resources. Responsible stewardship means that the commons don’t exceed their carrying capacity, and the only people able to decide this are those directly involved in using, accessing, managing and producing these resources. Neither businesses nor governments were created to manage the commons and, it seems to me, are doing a rather poor job of it. They don’t take everyone fully into account in their policy choices. That’s why the management and production of a commons should be decided by its stakeholders and trustees. This gives them the opportunity to participate in decisions about the resources, which directly affect them. SI: What is a social charter? JQ: A social charter is a declaration of intent by people to protect a community’s commons resource. It’s the first step that the stakeholders in a community take in planning a Commons trust (the establishment of the trust and its trustees is the second step). Generally speaking, the social charter is a written framework that outlines the rights and incentives of a community to manage and protect a common resource. It gives users, managers and producers of a commons an opportunity to state their expectations and responsibilities. The social charter includes a mission statement of people’s historical claims to the commons, an overview of their rights of fair access and use, and also a statement of how they would manage their resources under a trust. The charter helps to operationalize the management of a resource by demonstrating the intent of stakeholders to hold this commons in trust for future beneficiaries. SI: How would a trust be managed on the global level if we were talking about something that is beyond a local community’s ability to manage, like the ocean, atmosphere, maybe even oil, etc? Would the United Nations oversee it? JQ: It depends on the resource. Many resources could be managed by existing or newly created United Nations agencies, especially commons that are truly global like the oceans and the atmosphere. But also consider: aren’t food, health, education, energy and money also global commons? Would the UN be able to handle these commons, or would the people of the world need to be able to develop new trusts in affiliation with the UN? We know that trusts are usually created at local levels and local trusts have successfully managed local resources. This is why people are becoming interested in the possibilities of applying the concept of trusteeship at the global level. And that is exactly what has to happen, it seems to me. If we can’t create global trusts under the United Nations umbrella or through sovereign treaties or global institutions, then the people must step forward and organize them. For example, a genuine institution for the management of the global environment. That would be an obvious step, but why stop there? We need global trusts for the management of the international monetary system, for international finance, for overseas international commerce, and a trust to oversee biodiversity. We need trusts to carry out the international development agenda, to eliminate hunger, provide healthcare and education and to create jobs. These trusts are really crucial if we’re serious about developing effective and democratic global governance. I believe we are in a transitional phase in history. The 1944 Bretton Woods conference created a system of monetary management, establishing the rules for the commercial relations among the world’s major industrial states. The UN was created in 1945 to ensure political security for the world. This was the beginning of a new kind of multilateralism and it was truly innovative for its time. But this new international system had many flaws and wasn’t strong or flexible enough to keep up with events. Now it’s become an antiquated structure that is not serving the interests of the global community. We’ve got to get beyond the weaknesses of this old multilateralism and create something vital and responsive to the world’s needs. It seems to me that global trusts are a way of breaking through the present international stalemate. They move us into a greater awareness that the seas and seabeds, atmosphere, outer space, trade, finance and money and many other kinds of commons are actually beyond the ability of sovereign governments and the private sector to manage. To do this, the people of the world must organize and create trusts for their commons. We need the global citizens movement to become directly involved. And it appears to me that this is now happening. SI: How many Commons trusts are in existence today and in how many nations? JQ: I can’t give a number, but it’s certainly in the tens of thousands and they are found all over the world. The most well known are the trusts for land and forests. Trusts are constantly forming in local communities, but bioregional trusts are also emerging. For example, WANA Forum is calling for water and energy sharing agreements in the Middle East (www.wanaforum.org) and the Great Lakes Commons in the United States and Canada is having its inaugural meeting this Fall (www.onthecommons.org/work/commons-network/great-lakes-commons). Peter Barnes has also proposed a sky trust to manage the atmosphere (www. yesmagazine.org/issues/reclaiming-the-commons/sky-trust). By the way, it appears that the idea of the trust (called the waqf) originally began in nomadic regions of the Middle East during the time of Mohammed and spread to Britain in the aftermath of the Crusades. The Charter of the Forests in 1217 was an early call for a trust to protect people’s rights to the woodlands of Britain. In the United States, a venerable example of a trust is the New Castle Common (www.newcastlecity.delaware.gov/city-services/trustees). It was founded by William Penn in the 1700s and has been providing civic infrastructure for the town of New Castle, Delaware, for over three centuries. SI: At this time or transitional phase, is humanity beginning to re-evaluate its relationship with the commons in terms of sharing and sustainability? JQ: Yes. The commons are a way of talking about sharing and sustainability. This re-evaluation is clearly taking place. The pivotal aspect is that we are gradually moving away from the kinds of policies that emphasize ownership to policies that emphasize trusteeship. This is the fundamental shift that is taking place. Through individual commitments to sustainability under private ownership (like cap and trade) or state regulation (like carbon taxes), we are simply spinning our wheels. This is why more and more people are beginning to envision the need for trusteeship models. When we make collective commitments to sustainability through trusteeship, sharing will follow very easily….